rtists are sprinkled into Karen Lewis's family history. Her Aunt Grace painted hunting shacks and sleigh rides à la Grandma Moses. Some of that work still hangs in the house of Karen's mother  who also painted. The face-tickling mist at the base of a waterfall or the shadowed curve of a rock are just two possible inspirations behind Karen Lewis's paintings. Her desire is to re-create the feeling of the moment. "If I can capture these things, I almost feel as if I'm back there again," she said. "The paintings are memories of beloved moments. As such, some of them are hard to part with  particularly the ones I painted on family vacations." 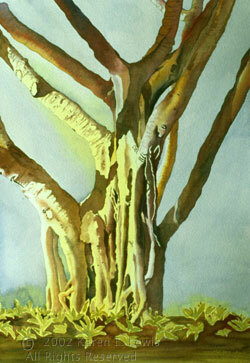 Karen works almost entirely in watercolor, with a little mixed media thrown in. "Watercolor has more varied possibilities than any other medium," she said. "It will do amazing things, and can be light and free-form as well as ranging in full value. "Water-media is just a catchall term for anything water based. It's what I use when listing everything would take too much room." That list could include: acrylic, Caran d'ache, gesso, hand-painted collage paper, gouache and egg tempera. 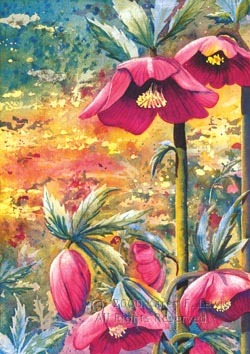 Karen's love of the outdoors shows in her paintings. She spent years kayaking, mountain climbing and camping until she was semi-grounded by having children. "Now that the kids are older, they don't want to go," she said. "I still do quite a bit of hiking and haul my paints along with me. I've been working on a series of Oregon waterfalls. "What better way to spend an afternoon than sitting in front of an inspiring waterfall with a box of paints? Most of my large studio work begins with an on-location sketch and photos." Karen enjoys looking at contemporary watercolorists, though it's hard for her to pick her favorites because she likes different artists for different reasons. "At this point in my career, I'm reaching toward a style of my own," she said, "rather than being influenced." Growing up in Pittsburgh, Karen did the usual coloring and playing with building blocks, but she also made up stories and songs. As she got older she tried lots of different crafts. By high school she was designing and knitting one-of-a-kind sweaters. "I had several high-school friends who were destined to be artists," she said. "But I, who had never learned to draw, was not." "I planned to go to college and major in music. I jumped from there to education, and the full extent of my fine-art experience through college was one drawing class and workshops in clay." It wasn't until her oldest daughter entered first grade that Karen became interested in painting. While volunteering at the Children's Art Institute, she watched Northwest artist Dory Kanter demonstrate how to drop watercolor paint into pools of water. "I saw the colors swirl and blend, and I was hooked," she said. 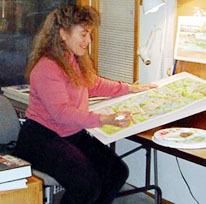 Once smitten with watercolor, Karen learned to paint and, subsequently, to draw. "I took several watercolor classes, studying with local artists like Susan Spears and Leslie Cheney-Parr," she said. "I read lots of books, actually did some of the exercises, and painted, painted, painted. "The best training to be an artist is to make art." Karen's dream for her art is that each piece goes to a home with someone who finds an irresistible nudge within the image. "Maybe it's a memory, maybe a feeling," she said. "But it somehow creates a connection with someone who enjoys looking at the painting as much as I enjoyed making it." 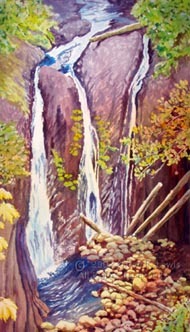 Karen's paintings can be seen through the end of this month at Hidden Springs Café, 19389 Willamette Drive, West Linn, Ore., her current hometown. 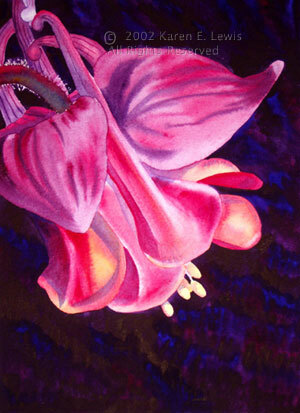 She'll have a painting at the Lake Area Artists Foyer Show, 368 State St., Lake Oswego, Ore., through June 14. "I'd like to encourage people to visit me at Portland Open Studios in October," she said. "There you can see me paint and see a large variety of my work." E-mail Karen at klewis77@comcast.net and check out her Web site. You can reach Kathy at kanderson138@comcast.net, and draw on other Sketch Pads.